Frozen beef is out. 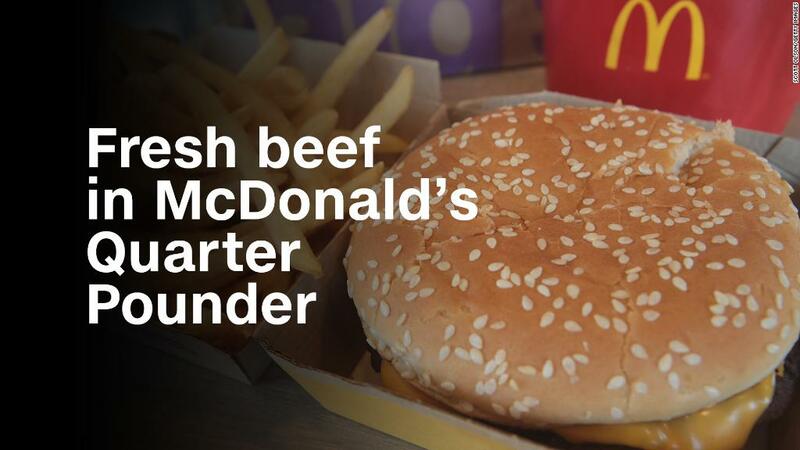 Fresh beef is coming to McDonald's Quarter Pounders. McDonald's (MCD) announced Tuesday that Quarter Pounders in every US store except for ones in Hawaii and Alaska will have fresh beef without added preservatives starting in May. McDonald's Signature Crafted Recipe burgers will also have fresh beef patties. The switch does not apply to Big Macs and regular hamburgers and cheeseburgers. "The switch to fresh beef quarter-pound burgers is the most significant change to our system and restaurant operations since All Day Breakfast [in 2015]," said McDonald's USA President Chris Kempczinski. McDonald's has changed its ingredients and menu to shift customers' perceptions about the food. Its latest move also responds to rivals such as Wendy's targeting McDonald's frozen beef in ad campaigns. "This coincides with a national consumer demand for items that they perceive as healthier and higher quality," said Ernest Baskin, an assistant professor of food marketing at St. Joseph's University. In 2016, McDonald's removed artificial preservatives from Chicken McNuggets. Last year, it took out preservatives from ice cream. McDonald's has been tinkering with Happy Meals for several years in response to pressure from public health groups, and to lawsuits for using toys to market to kids. In 2011, it added apple slices to Happy Meals. Soda came off the menu in 2013. Last year, McDonald's replaced Minute Maid apple juice with its lower-sugar Honest Kids brand juice. And the company said last month that it will phase out cheeseburgers from the menu, although parents can still ask for them.